WINNIPEG — It’s hard to find a more aggressive coach than Chris Jones, and on Sunday it paid off for the Eskimos. Jordan Lynch scored a one-yard touchdown on third down with 3:22 left, sending the Edmonton Eskimos to a 26-20 victory over the Ottawa REDBLACKS in the 103rd Grey Cup presented by Shaw. 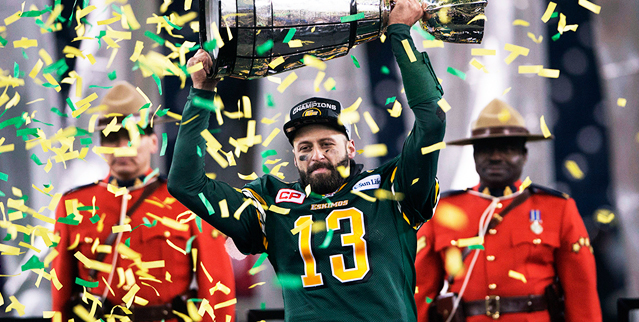 Mike Reilly threw touchdown passes to Adarius Bowman and Akeem Shavers while completing 21 of 25 passes for 269 yards, while Edmonton’s defence allowed only four second-half points to guide the Eskimos to their first Grey Cup since 2005. The REDBLACKS opened with a scoring surge with a pair of touchdowns on their opening two drives, but the Eskimos battled back to take the lead at halftime. After entering the fourth quarter behind, Edmonton scored the go-ahead touchdown on a drive fueled by two pass interference penalties. Henry Burris threw for 220 yards and a pair of touchdowns in the loss, but was also intercepted by Patrick Watkins and failed to generate a touchdown after the opening two drives. While the focus was on Ottawa’s big four entering Sunday, it was Maurice Price getting the REDBLACKS’ offence moving out of the gate. Price caught a pass over the middle on second and 10 to give Burris and the REDBLACKS a first down and that got things moving. On the next play, Burris hit Ellingson on the slant over the middle to move the sticks again. Two runs by first-year CFL running back William Powell kept the drive alive, then inside the 25 Burris hit Chris Williams on the right sideline to put Ottawa inside the four. On first down Burris went play action, then pulled the ball down and hit Patrick Lavoie to put the REDBLACKS in the end zone. Burris went 5-for-6 on the game’s opening drive for 60 yards and a touchdown, giving the REDBLACKS the first strike and a 7-0 lead in the 103rd Grey Cup only 3:43 into the game. The score capped off a seven-play, 73-yard drive as Ottawa set exactly the right tone for the game. The REDBLACKS’ early momentum went from a spark to a surge on the very next play. Esks’ shifty returner Kendial Lawrence fumbled Edmonton’s first kick return of the game as Jake Harty forced a loose ball, and there to recover was Damaso Munoz. Powell sprinted up the heart of the Esks’ defence for 15 on the first play of the next drive, then Burris made his sixth straight completion on a slant over the middle to Ernest Jackson for 15 more. With a first-and-goal from the 10, the 40-year-old Burris wasn’t fooling around. After a run was stopped on first down, Burris threaded the needle to Jackson in the end zone for a seven-yard score. Chris Milo missed the extra point, but Burris’ second touchdown of the game and seventh straight completion put the REDBLACKS ahead 13-0 before Reilly and the Eskimos’ offence could even touch the football. The Eskimos needed a response from their offence, which scrimmaged from the 32-yard-line on its first possession of the game. A completion to Bowman and a pass interference penalty against Antoine Pruneau set up a three-pointer by Sean Whyte to get the Eskimos on the board. While the drive didn’t end the way the Green and Gold had hoped, it started turn the momentum a little bit in the Eskimos’ favour. That continued on the defensive side of the ball when Burris looked to go long on second down, only to be intercepted by cornerback Patrick Watkins. Already Reilly’s favourite target, Stafford moved the sticks with a key second down conversion and held onto the ball in Ottawa territory for a 24-yard pickup. After running for a first down, the Eskimos’ gunslinging quarterback hit Bowman on the corner route for a 23-yard touchdown and just like that it was a new ballgame. Reilly’s first career Grey Cup touchdown pass made it a 13-10 game with two minutes left in the opening quarter, capping off a five-play, 60-yard scoring drive over 2:30 span. Now it was the REDBLACKS needing an answer, but they were victimized by the game’s first sack as Marcus Howard got to Burris and took him down. Howard was hit with a 15-yard penalty on the play to give Ottawa a second chance on the drive, but an Odell Willis sack right after forced Ottawa to punt while putting an end to the opening 15 minutes. The REDBLACKS appeared to have another big defensive play when Brandyn Thompson scooped up a fumble and returned it for seven, but it was negated by an offside penalty by Justin Capicciotti. On the same drive though Jonathan Williams sacked Reilly, forcing the Eskimos to punt as the defences settled in. A catch-and-run by Powell set up Milo’s first field goal of the night to make it 16-10 Ottawa, while the Eskimos missed a 45-yard field goal try and the REDBLACKS were forced to punt. Down six with under two minutes left, the Esks’ offence looked to strike and take the lead before halftime. Shamawd Chambers got the drive started with a gain into REDBLACKS’ territory on his second catch of the game, then Reilly kept things moving with some fancy footwork. A pass to Walker for 17 yards along the right sideline gave the Eskimos another first down, and then with the clock ticking and under half a minute left, Reilly found a wide open Akeem Shavers for a 13-yard pickup inside the two. Reilly went right back to the rookie running back on the next play, and with 12 seconds left in the half the Eskimos took their first lead of the game – 17-16. That 85-yard drive on which Reilly completed all five passing attempts sent the Eskimos into halftime with the lead. The REDBLACKS took the lead back on a 33-yard field goal following a seven play, 75-yard drive to make it 19-17. Edmonton cut the lead in half with a single point on a punt, but the defences dominated the third quarter as the contest became about field position. Late in the third though the Eskimos began to tilt the field in their favour. A third down conversion moved the sticks and then a catch by Cory Watson moved the Eskimos into Ottawa territory. Reilly used his legs to keep the sticks moving again, but a stalled drive proved costly. The Edmonton Eskimos grabbed their first Grey Cup Championship since in 10 years with their win Sunday. CFL.ca has sideline-to-sideline coverage in the 103rd Grey Cup Centre. Whyte missed his second field goal of the game, putting this try off the uprights from 35 yards out leaving the REDBLACKS up by a point, 19-18 entering the fourth and final quarter. A close game entering the fourth quarter appeared to be in Edmonton’s favour, as the Esks had outscored opponents 107-22 in fourth quarters during their current nine-game winning streak – an average margin of eight points. In the fourth quarter the defensive duel continued though. The REDBLACKS added a single point to their lead on a 72-yard punt by Milo, while their defence responded with a two-and-out against Reilly. The Eskimos’ defence rose to the occasion though and the next time Reilly got the ball back he got aggressive. The veteran pivot fired down the right sideline and while his pass fell to the turf, an interference penalty against Abdul Kanneh gave Edmonton a first down at the 47. Reilly went long again on the very next play, and this time after a challenge by Chris Jones there was another pass interference. After the penalty moved the Eskimos to the Ottawa 10, a completion to Nate Coehoorn put the Esks at the one. Down two with under four minutes left facing a third and goal from the one, Jones opted to gamble on scoring the go-ahead touchdown. And after a second effort, short-yardage quarterback Jordan Lynch was able to power his way over the line to give Edmonton a 26-20 lead following the two-point conversion with 3:22 remaining. Burris moved the sticks with a 14-yard completion to Price on second down as the REDBLACKS moved near midfield, but Ottawa’s drive quickly stalled after that. An incompletion by Burris and then a sack forced Rick Campbell’s hand in punting the football away with two minutes left, and his offence never got the ball back as the Eskimos moved the chains three times to melt away the clock. The win marks Edmonton’s 10th in a row, all with Reilly under centre since he returned from a knee injury to start the Labour Day rematch against Calgary. In those 10 games the Eskimos defeated division rival Calgary three times to not only win the West but ultimately represent the West in the Grey Cup. The loss for Ottawa is a disappointing end to a campaign the city will never forget, as the REDBLACKS mounted one of the greatest turnarounds in CFL history in going from two wins a year ago to 12 wins and a Grey Cup appearance this year. Burris had a career season for the REDBLACKS and won Most Outstanding Player for his efforts at age 40, while Ottawa boasted four 1,000-yard receivers and the CFL’s number one-ranked offence.